The beginning of the school year marked the beginning of a new community partnership between the Pacific Ridge Middle School Service Learning Program and Carlsbad's Jefferson Elementary School. So far, the collaboration has been fantástico for all involved! The 4th-grade students at Jefferson have been learning Spanish via Rosetta Stone, and Pacific Ridge students were able to supplement the education technology with a more hands-on approach. Students led a multitude of immersion games, performed short skits, and helped the kids practice their speaking skills. 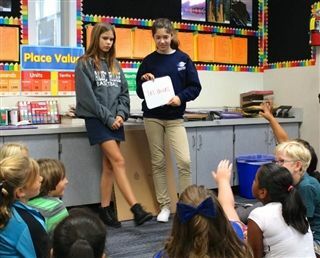 Each week, middle school students paired up to plan and implement lessons on content including greetings and farewells, the alphabet, numbers, and days of the week.